The SEAT Leon Estate is part of a wide range of large family cars produced by VW Group, which also includes the Skoda Octavia Estate and the Volkswagen Golf Estate. Each car has their own distinguishing characteristics, and if striking styling is on your wish-list of attributes, the SEAT Leon has enough to tick that particular box. Derived from the Leon hatch that scooped the 2015 Best Family Hatchback Carbuyer award, the Sports Tourer Estate has bags of equipment, offers an entertaining driving experience, and represents good value for money. 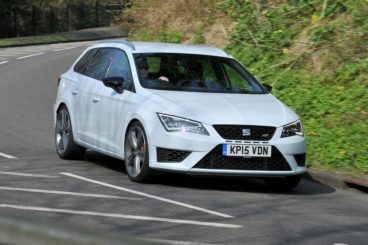 OSV takes a closer look with our SEAT Leon Sports Tourer Estate review. The Leon Estate is arguably more stylish than the Golf and the Octavia Estate’s, but strip away its handsome body and you’ll find that it shares the same underpinnings. And if what’s inside is what matters the most, you’ll be pleased to learn that this car drives like the best of them. There are two separate rear suspension setups available; if you opt for a less powerful engine, you’ll get a simpler system. Go for a more powerful unit and you’ll be rewarded with a multi-link rear axle which enhances ride and handling. With that said, even the simpler setup offers a fun on-the-road experience. The racy 276bhp Cupra model adds electronically adjustable Dynamic Chassis Control dampers too, and this further enhances your ride enjoyment by letting you switch between comfortable and sporty suspension settings. Employ the sporty mode and body lean is virtually eliminated in bends. The steering is overall consistent, but it’s not always easy to gauge how much grip your front tyres have. The exception is the Cupra 280 model, where everything is much sharper. You are spoiled for choice when it comes to engines. The diesel line-up begins with the 109bhp variant and is topped off by a rapid 182bhp unit that can get you from rest to 62mph in 7.8 seconds. The petrol range, meanwhile, kicks off with a 1.2-litre petrol unit that is the cheapest available, which still comes with a punch. It’s small, but it’s capable and can haul this machine from rest to 62mph in 10.1 seconds. It isn’t as powerful as its diesel counterpart, and performance will take a hit if your car is fully loaded. Performance gets better as you make your way up the petrol range. A 2.0-litre 276bhp engine rounds things off, and can gun you from 0-62mph in just 5.8 seconds before maxing out at 155mph. The SEAT Estate is a comfortable place to be inside thanks to a sophisticated suspension setup. Opt for a Cupra model and you’ll benefit from enhanced comfort thanks to the adjustable dampers. The car is quieter inside than last time around, but the larger boot does mean that noise tends to echo around the cabin more than it does in the hatch. VW Group has understandably held back from equipping it with the kind of upmarket fit and finish saved for their VW Golf Estate, but if you don’t compare it with the VW or the Audi, you’ll surely be mighty impressed by this car’s interior. Plastic quality is very good, and the dash looks slick and contemporary. It comes with a modern, easy-to-operate 5” touchscreen as standard. The boot here is a lot larger than the one in the hatch and measures at 587-litres. It isn’t all that simple to fold the rear seats in the entry-level model, but this mechanism does get easier as you work your way up through the trims. Once the rear seats are down, the size increases to 1,620-litres. The boot floor is adjustable, and wheel arch intrusion is kept to a minimum. This Estate has more room available than its predecessor, and five adults should be able to sit in relative comfort, even on longer journeys. The rear doors open wide for easy access, though whoever sits in the middle rear-seat will find their legroom is compromised by the central transmission tunnel. Standard equipment across the range is decent, with the base-level variants getting Bluetooth phone connectivity, air conditioning and a 5” colour display screen. But the absence of alloys makes this entry-level trim a little bit too basic. The SE model adds 16” alloys, a leather-trimmed gearstick and steering wheel, as well as fully adjustable seats. There is also electric windows and a rear-seat folding mechanism. The SE Technology Business Edition trim, meanwhile, adds a DAB radio, LED headlights and sat-nav. Prices for the new Leon ST Estate start out from around £18,500 and rise to a little over £25,500. If you’re thinking of leasing it over three years, you’d be looking at paying somewhere between £140 – £250 + VAT. In terms of running costs, the cheapest engine in the range is the 1.6-litre 109 bhp diesel, a unit which is also used in the Volkswagen Golf BlueMotion, and which can return an astonishing 85.6mpg. It also costs nothing to tax. The more powerful 182bhp is paired up with an automatic box but can still return over 60mpg. The petrol engines will, of course, cost you more to run, but their frugality is enhanced by the introduction of the stop-start system which halts your engine whenever your car isn’t moving. The entry-level 1.2-litre engine is good for 57.6mpg, while the 1.4-litre unit can return around 49mpg. The warranty on offer is standard fare and covers you for 60,000 miles. You should take your car in for its first service after two years, and SEAT provides a fixed-price service plan that you can pay in a series of 24 monthly instalments. It’s rare for cars in this sector to offer such an interesting variety of engines. Altogether, there are 6 turbocharged power plants for you to ponder over, all of which are shared with other SEATs. Some are even taken from Volkswagen’s. All the engines are pleasingly efficient and performative and are available with 5 or 6-speed manual ‘boxes or six or 7-speed dual clutch DSG automatics. It depends on which motor you choose. SEAT’s are known for their sporty looks that appeal to our racier nature. It was never going to be easy for VW Group to transfer the slick looks of their hatchback to a larger car, but they’ve managed to do it without much harm. It’s easily one of the finest looking cars of its type and is therefore suited to young families who still want a car that looks the part. Most cars in this market sacrifice entertainment for comfort. Not the Leon ST Estate, though. This family car is fun to drive and involves you in the whole driving experience. You can optimise engagement further by purchasing one of the more powerful variants that come with a multi-link rear axle suspension set-up. You get what you pay for, but we’d expect all SEAT’s to come with alloys as standard. Yet the sporty brand has refrained from giving its S model such basic ‘treats’. The base S model also features awkward rear seats that are difficult to fold down for more boot space and is on the whole too skeletal. When it comes to practicality, this car does have its moments. But there are little issues that might niggle, such as the fact that rear seats are seriously hard to fold in the entry-level model, and the boot could have had more space were it not for the wasted room underneath the spare wheel. The SEAT faces some stiff competition from its VW Group mates. 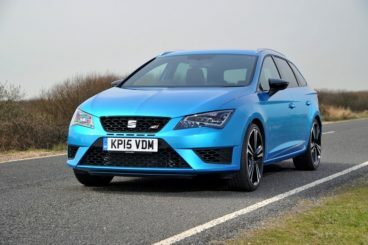 Let’s see how it fares in the comparison section of our SEAT Leon Sport Tourer Estate review. There isn’t a massive amount that separates these two cars. 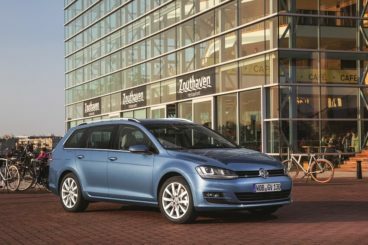 Arguably the Volkswagen Golf Estate’s strength is its luxurious interior. Usually, a large Estate as this struggles to match the interior of the hatch from which it’s derived, but VW have pulled out all the stops to make sure that it looks and feels just as upmarket. 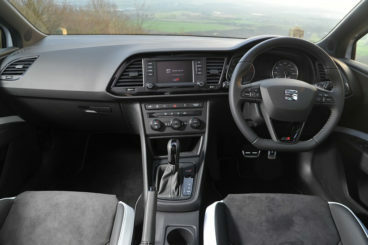 The SEAT Leon Estate’s interior, conversely, looks bland when you compare the two. The VW also lets in a lot less noise. Practicality is good, too. Entrance to the VW Golf Estate is easy, and it has a boot that is 18-litres bigger than the one in the SEAT. The boot floor is easily adjustable while folding the rear seats is super easy even in the entry-level. The SEAT Leon Estate is more fun to drive, although the Golf offers more entertainment than it has done in the past. The steering is lighter and nimbler, while adaptive dampers are available as an optional extra. Handling though is average at best and does let the Golf Estate down somewhat. The GTD diesel unit can rival the best the SEAT can offer regarding speed and can get you from rest to 62 mph in just 7.9 seconds before maxing out at 143mph. Running costs are good in both cars, but the Leon ST is cheaper to run. It has the ace card of a 1.6-litre 109 bhp diesel unit that returns 85mpg, and will work out cheaper to run over three years than the Golf. Like the SEAT, the VW’s entry-level model is too basic and yet it’s other trims are costly. Skoda pride themselves on offering value for money and cars that are reliable, safe and inexpensive to run. Surprisingly, the SEAT ST Estate offers a more frugal engine than the Skoda. Its 1.6-litre 109bhp unit returns 85mpg, which outdoes the 80mpg returned by the cheapest power plant to run in the Octavia Estate’s canon. Overall, though, the Skoda is dirt cheap to run, and it’s also super safe and reliable. If you need a large family car that you can depend on, the Octavia isn’t going to let you down, and it finished highly as usual on Driver Power’s most recent survey for consumer satisfaction. The SEAT is, however, more entertaining. And while you’ll have a ball behind the wheel of the Leon Estate, the Skoda Octavia Estate is a more measured and comfortable affair. It’s a solid enough driving experience, and you’ll certainly feel secure, but it lacks keenness, thanks in part to the absence of front differential. The engine range is varied, and most of the units are capable enough. They don’t feel particularly quick, though. What separates the two inside is space. While they both benefit from soft-touch finishes but an ultimately bland interior, the Skoda swathes you in space and indeed has more room than a Ford Mondeo. The Leon Estate is 23-litres shorter, thanks to its sleeker shape. The Skoda also offers alloys as standard throughout the range, as well as an overall more generous amount of standard kit. The SEAT Leon Sport Tourer is like that fun-loving, perennially single friend we all have whose life contrasts sharply with staid and safe couples who are struggling to come to terms with their new life which involves spending their Saturday evenings choosing wallpaper. It’s a hip family car that is entertaining to drive and great to look at. It’s the one that all those dull-looking, boring-to-drive Estate’s need to be jealous of. It does have a sensible side, too, and is spacious, practical and efficient. 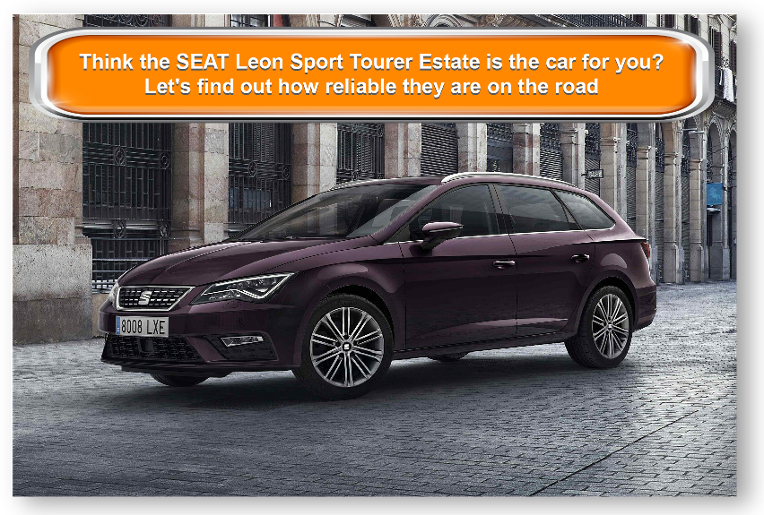 The SEAT Leon Sport Tourer Estate is also affordable and represents good value for money. Looking For A Price For The SEAT Leon Sport Tourer Estate?